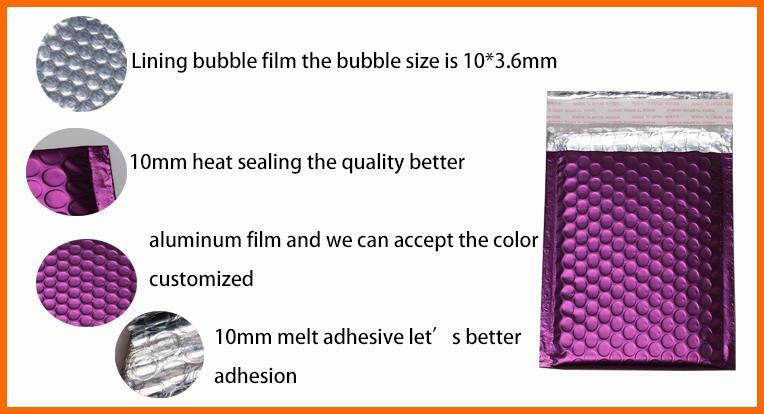 Metallic foil bubble mailers have all the advantages of a standard bubble bag, with a bubble liner and a full laminate to protect the contents and prevent tearing or puncture. It is highly protective and easy to seal. Our stunning metallic bubble mailers are available in a variety of different sizes with safe strip and seal strips. Our dazzling metallic foil bubble mailers are the perfect and affordable way to mail your items. These colorful bubble bags are dramatic and stylish, adding more excitement to your packaging, which are perfect for gifts, promotions, rewards or just to make your package stand out. Metallic foil bubble mailers are fully laminated for superior cushioning, combining all the protective features of traditional bubble-lined envelopes with elegant silver to give your packaging a bold, elegant look. * Self-sealing. light in weight and saving transportation costs. * Tamper-proof seals provide safe transportation, great for your various mailing needs. * The high-slip smooth bubble cushioning material allows for faster and easier insertion. * Metallized surfaces greatly reduce radiant heat transfer, keeping your product at the desired temperature during transport.